Instead of throwing away all of those plastic Easter eggs, how about repurposing them? 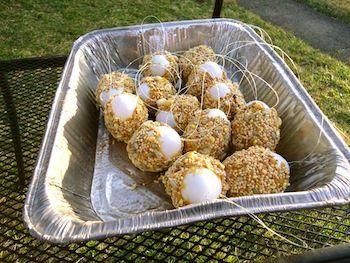 I ran into an excellent idea that is both creative and nature-friendly: Plastic Easter Egg Bird Feeders. 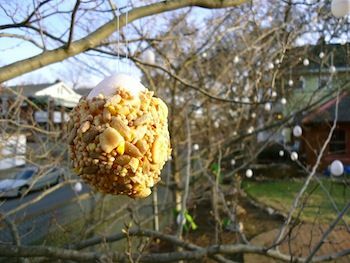 You can feed the birds without having all those bulky traditional bird feeders. 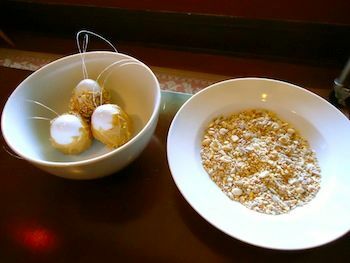 ***Try using crunchy peanut butter as your base coat for the egg. You can also add rolled or quick oats to the mixture, as well as, raisins. If you do use raisins and own dogs, hang the bird feeders where they cannot get to the fallen food. Raisins can cause health problems in dogs.